We have implemented a number of tools in the MBAC Galaxy Portal to support a Systems Biology approach to the analysis of the Metabiome (the interactions of the Microbiome, Metabolome, and Immunome). These include tools to calculate Correlation Netwoks for complex data matrices and for calculating the statistically significant differences (Correlation Difference) of two Correlation Networks. 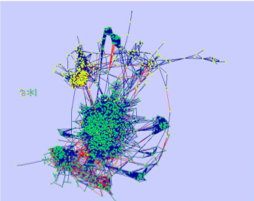 The networks can be visualized in Cytoscape. This approach visualizes potential interactions between the microbiome, metabolome, and immunome. One can then generate new hypothesis (i.e. knowledge discovery) that can then be used for hypothesis driven experimental models. We have implemented a local version of Qiime in the MBAC Galaxy Portal. 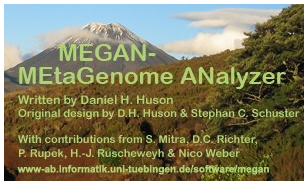 Qiime (Quantitative Insights Into Microbial Ecology) is an open source software package for comparison and analysis of microbial communities, primarily based on high-throughput amplicon sequencing data (such as SSU rRNA) generated on a variety of platforms, but also supporting analysis of other types of data (such as shotgun metagenomic data). QIIME takes users from their raw sequencing output through initial analyses such as OTU picking, taxonomic assignment, and construction of phylogenetic trees from representative sequences of OTUs, and through downstream statistical analysis, visualization, and production of publication-quality graphics. QIIME has been applied to single studies based on billions of sequences from thousands of samples. 04/12/2013 We added PICRUSt (0.9.1) tools for the prediction metagenome functional content from 16S rRNA. This includes tools for manipulating BIOM formatted matrices. 04/25/2013 Qiime Version 1.6.0 has been installed. 04/25/2013 Qiime Tutorial for basic workflow. |SE|S|AM|E| Barcode is a user-friendly web application for barcoding amplicon sequences obtained through NGS. The software automatically processes DNA sequences datasets, sorting for multiplexed loci and samples identified by oligonucleotide tags, and allows for the assignment of sequences to a preloaded reference library (from Genbank to in-house scale). The results are displayed both as samples-based synthetic tables and graphical representations. The deliveries of |SE|S|AM|E| Barcode was developed with multiple applications in mind, such as specimen assignment to species referenced in DNA libraries, molecular characterization of trophic networks or more generally metagenomics and environmental barcoding studies. The MBAC local copy is available within the GMU firewall. Directions are available to setup a proxy connection for use outside the firewall.